AN anti-anxiety drug, not available on the NHS, is posing a new risk in Northern Ireland, where it has been linked to a rising number of deaths over a three-year period. The Detail can reveal that alprazolam, also known as Xanax, has featured in 43 deaths in Northern Ireland from the beginning of 2015 to the end of 2017. The drug was registered on death certificates where individuals had taken a number of drugs and in 2017 it was a contributory factor in one fifth of the total 136 drug-related deaths in Northern Ireland. Alprazolam is better known in the US where it is widely prescribed to treat anxiety or panic disorders and is sold under the trade name Xanax. A member of the benzodiazepine family of tranquilisers, alprazolam acts as a relaxant and can induce drowsiness, sleep, and coma and has gained some popularity among recreational drug users. The highly addictive medication can only be obtained on private prescription in the UK. Xanax and counterfeit versions of the drug, however, are coming into Northern Ireland through illegal imports, the internet, and the dark net – the latter is a largely anonymous online platform where illicit goods and services are traded across the globe. Pfizer, the company that manufactures Xanax, said it was "alarmed" at the rise in counterfeit Xanax and its availability on the internet and dark web. This year alone an operation targeting illegal drug imports, led by the police and other agencies, intercepted 30,000 Xanax tablets coming into Northern Ireland. The Detail has also found evidence of the drug being openly promoted on the internet for sale and delivery within the UK for as little as 65 pence per tablet. A Northern Ireland coroner said Xanax is now featuring in deaths where individuals had taken a number of drugs. The number of deaths in Northern Ireland where the drug has featured on a death certificate increased from one in 2015 to 26 deaths in 2017. Xanax was not a drug of concern two years ago when Mr McCrisken spoke to The Detail about the misuse of prescription drugs, such as diazepam and tramadol. Speaking now, the coroner said: “We didn’t really see this coming. We never really heard of alprazolam two years ago and now it’s involved in one fifth of all drug-deaths occurring in 2017." Provisional estimates on the most recent drug-related deaths, provided by the Northern Ireland Statistics and Research Agency (NISRA), further suggest there were 16 deaths in the first half of 2018 where alprazolam or Xanax was mentioned on the death certificate. Mr McCrisken said he expected the number of deaths where Xanax features to rise further this year: “We don’t have a full figure for 2018 yet but I would estimate that it will increase. “It’s a sign of the new problems we’re facing and are going to face. There are massive problems with supply and there are so many different forms of supply now. It’s not just that someone is getting extra drugs from their GP and selling them on. These things are available so easily on the dark web." Since 2015, at least 10 inquests have been held to date in Northern Ireland where Xanax or alprazolam has been a contributory factor in death, the Coroners Office confirmed. Where a drug is mentioned on a death certificate, this does not necessarily mean it was the primary cause of death but indicates that the drug may have contributed to the cause of death. Mr McCrisken said: “There hasn’t been a single death where the death has been due to alprazolam alone. It has always been found with another drug or other drugs, probably more than one. It’s not clear if the drugs implicated in Xanax-related deaths in Northern Ireland are counterfeit versions of the benzodiazepine or are authentic prescription drugs illegally sourced from other countries. Mr McCrisken told The Detail: “It’s thought that these pills are either coming from the Republic of Ireland, where it is available legitimately on prescription, and is being brought across the border or it’s more likely these are fake alprazolam tablets or bars that are being shipped in. Xanax or counterfeit versions of the drug, Mr McCrisken said, are being traded in a highly concentrated ‘bar’ format that can contain as much as 2mg of alprazolam: “The bars are the most worrying because there’s a huge amount of alprazolam in them." In addition to being highly addictive, Xanax can have a number of side effects including, sweating, and heart palpitations. Mr McCrisken continued: “What we’ve tended to find is that people treat someone, who’s overdosed on drugs or taken too many prescriptions drugs, in the same way as someone who has taken too much alcohol. Which is to put them to bed and hope they sleep it off. You don’t really sleep off a drug overdose. You die if you don’t get proper treatment. The internet and dark net has opened up a new global online market where criminals can trade illicit and often counterfeit drugs like Xanax. The European Monitoring Centre for Drugs and Drug Addiction estimates that around two thirds of the goods offered on dark net markets are drug-related. The Detail, however, did not have to delve into the dark net to find the drug for sale. 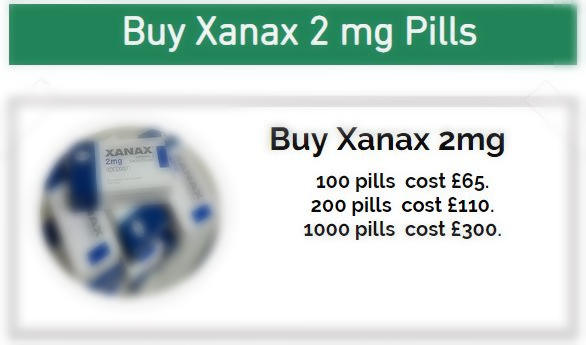 We found a number of websites openly claiming to offer Xanax and other benzodiazepines for sale and delivery to the UK. Prices were as low as 65 pence per tablet, as the following graphic shows. Authorities across the globe are clamping down on illegally imported and unauthorised medicines through targeted operations like Operation Pangea. Under this international operation 500 tonnes of illicit pharmaceuticals were seized world-wide this year. In Northern Ireland, the operation was co-ordinated by the Organised Crime Taskforce Strategy Group and intercepted multiple packages containing 60,000 tablets over a number of weeks. The drugs haul included 30,000 Xanax tablets, as well as 25,000 Zopiclone tablets, a type of sleeping pill, and other drugs often taken for recreational use. Anthony Harbinson, chair of the Organised Crime Taskforce Strategy Group, said: “During Operation Pangea the UK Healthcare Products Regulatory Agency also targeted websites on the open and dark web that offered falsified and unlicensed medical products leading to 123 websites being shut down and the removal of 535 online adverts. Pfizer, the pharmaceutical company behind Xanax, expressed alarm at the rise of counterfeit Xanax and its growing availability on the internet and dark web. The company, which operates a counterfeit medicines division, confirmed that dangerous substances had been detected in counterfeit Xanax analysed. A spokesperson for Pfizer said: "We have found dangerous ingredients such as boric acid, heavy metals and floor polish in counterfeit medicines. Pfizer has always been at the forefront in the fight against counterfeits and the criminals behind them. We will continue to work side by side with all law enforcement agencies around the world to help detect, disrupt and deter counterfeit medicines trade." The UK-wide Report Illicit Drug Reactions (RIDR) database, run by Public Health England and designed to monitor harm caused by illicit drugs, has reported Xanax use as an emerging drug risk across the UK and Northern Ireland. 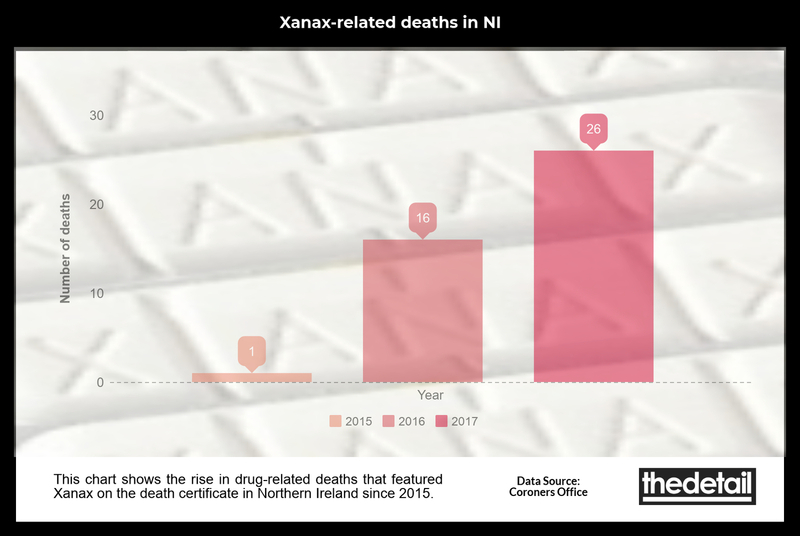 In November the database reported a rise in the availability and use of Xanax in Northern Ireland. “Northern Ireland confirmed reports of increased Xanax misuse and overdose among adults, particularly heroin users,” the latest RIDR report stated. Across the UK, “most” of the Xanax being sold on the street is “illicitly manufactured”, the monitoring service reported. In January the Public Health Agency (PHA) in Northern Ireland issued a warning about the dangers of misusing benzodiazepines. The warning was prompted by a number of reports of increasing Xanax use via the Drug and Alcohol Monitoring and Information System (DAMIS) – an ‘early warning’ system to identify emerging trends in drug and alcohol misuse in Northern Ireland. The PHA’s drug and alcohol lead Michael Owen told The Detail: “All drugs carry risks, therefore the PHA strongly recommends that you do not take anything unless it has been prescribed to you by a medical professional and in accordance with your prescription. “Unregulated substances can often contain the active ingredient the supplier claims, but it is sometimes at a higher potency than expected, so there can be a real risk of overdose to anyone who takes these. Visit https://www.drugsandalcoholni.info/for information on support services.